A few nights past, I was able to head into Wichita State’s Cessna Stadium for a Drum Corp International competition with my mom, uncle and sister-in-law. It has become a bit of a family tradition since my cousin Dieter marched with a corp called the Troopers for seven years. 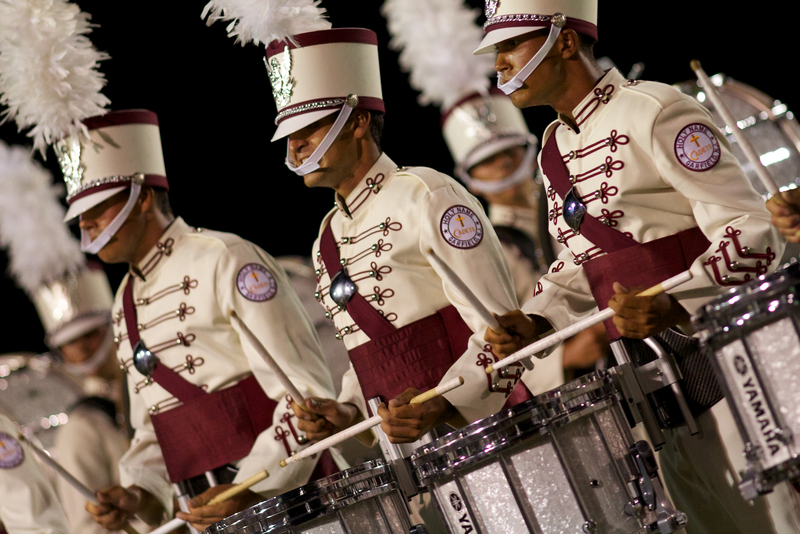 For those not familiar with drum corp – I wasn’t until my cousin got involved – it’s a bit like marching band – on steroids, and it’s pretty amazing. You can watch the video at the end of this post to get the full experience and if ever there is a competition near you, I’d heartily encourage you to go. You won’t regret it. Dieter is no longer marching but is traveling with a corp called the Cadets this year as their videographer. It’s a great gig as he is an up and coming media guy, taking great photos and shooting some fantastic videos. You can check out more of his stuff out at Dieter Wiselogel. As a rookie to drum corp, I can tell the difference between the bad, the good and the great performances and you could too. The sound, the storytelling and the shows are just different and the top corps will take your breath away. The show we attended was no different. The first two shows had fewer members and put forth okay performances. There were flashes of brilliance, but nothing sustained and nothing to take your breath away. The last four corps were great though. The sound they produce is at times crushing in its immensity and at other times like a gentle breeze to sooth the soul. The story they tell with the music and with the dancers is mesmerizing. Their shows were amazing. Dieter had the night off from shooting film and so was able to sit in the stands with us to enjoy the show. It was interesting to sit with a professional, someone for whom drum corp is a passion and whose expertise can recognize what my eyes cannot. He added that extra bit of insight that took my appreciation for what I was seeing up one notch. There were a lot of takeaways from my night at the drum corp event. The passion with which these kids pour into their summers, night after night, show after show is fun to see. They’ll practice all day in 100 degree weather, put on a show and be out practicing again after the show in the parking lot before their bus takes them – overnight – to their next destination. There, they’ll disembark and crawl into sleeping bags thrown down an a gym floor for a few hours of sleep before they wake up and do it all over again. The passion of these kids is something I hope everyone can find in life, find and then ride. But the thing that most impressed me about night was the encore. After the last show, the Cadets, had left the field, one of the earlier acts marched back on to the field to give the audience an encore performance while the judges tabulated the scores. I leaned over to Dieter and asked if the corps enjoyed giving the encore. They had been practicing all day in 100 degree weather. They had slept on a high school gym floor the night before. They were tired, stinky and had already given a truly amazing performance. Dieter confirmed what I would expect – most corps dread their turn for the encore. And so as the Madison Scouts marched back out and took their places in front of the grandstand for what would be our last memory of the evening, my expectations were low. The drum and bugle corp formed a half circle behind the larger, stationary percussion instruments and their drum major took his place in the stands so his musicians could see him. The drum major raised his hands and they began. They poured everything out. They had fun. They put forth big, amazing brass sounds that blew the crowd away. For ten minutes they put on a musical spectacle that was a gift to us all. They didn’t need to do it. They could have packed it in. The night was already a success. The crowd had been given more than their money’s worth already, and yet the Madison Scouts gave more. I suspect it’s the same with all the great corps. It’s why they are great. It’s what separates the men from the boys. It’s the ability to dig deep and give the gift even when it’s not needed, even when it’s not expected. And it’s what we all should aspire to as fathers and mothers, as employees and employers, as leaders and entrepreneurs and people. It challenged me to think about how I could be like the Madison Scouts and give my best even when I am tired and want to pack it in, even when it wouldn’t be expected, even when there is no real reward in return. It’s something I want to work on. How have you given the gift of your best even when it wasn’t expected or needed in this last week? What a great insight, Aaron. It was a great evening and fun to be together. Passion is not just for the young, but those kids are amazing beyond words.